I did a training yesterday, and I knew exactly when the eye-rolling would start: When I began explaining the "rule of three," which suggests you'll have an easier time remembering what you want to say if you stick to an outline of three key points. The bonus: It's easiest for your audience to remember as well. This time-honored principle developed over time, like all good rules. In the days before the written word, news was passed from village to village by storytellers whose tactics over time developed into telling stories built around the rule of three. (It's why we have so many fairytales and folk tales constructed with threes--from three little pigs to three princes vying for the hand of the princess.) The rule of three made the stories easier to recall for the teller, and for the hearer--who then could remember and repeat them later. But the rule of three doesn't just exist in fairytales. In You can only remember 3-4 things at a time (the magic number 3 or 4), you can read about modern research around the magic three and how it helps us remember all sorts of things like phone numbers--which, in the U.S., are broken into three chunks of three or four numbers to make them easier to recall. This post also notes that three's the number your listener can process when taking in the information, an important point for speakers to recall. If you're presenting to decision-makers or trying to persuade an audience, making the case in three points allows them the space to process and come along with your arguments, rather than lose their way. I get the eye-rolling, generally, from trainees who don't want to be limited--typically, those with lots of data to share. But, as I point out to them, none of my trainees lacks for things to say, and many I've trained can't recall it all when they need to do so. And I've yet to meet the audience member who wished you'd go on for the several hours it would take to share everything you know. So the rule of three becomes essential in creating a workable situation for both speaker and listener. Group lots of data into a manageable set of "chunks"
The post linked above also includes references to some of the research on the rule of three, as well, so you can explore this further. 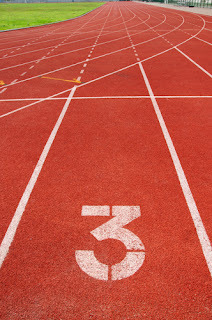 Have you used the rule of three when you speak?